As a native of the Free State, Rabbi Ari Plost says he’s never been more proud. Rabbi Plost was referring to the planned creation of a statue, memorial park and learning center in honor of Thomas Kennedy (1776-1832), a member of Maryland’s House of Delegates and State Senate. A devout Presbyterian, Kennedy reportedly never met a Jew throughout his lifetime. Only about 150 Jews lived in Maryland while he worked on his bill, which passed in 1826. The Thomas Kennedy Park will be located across the street from B’nai Abraham, which is at 53 E. Baltimore Street in downtown Hagerstown. The plaza will be on a site where a pair of blighted buildings were demolished about two years ago. The small public plaza will feature a bronze figure of Kennedy as well as educational inscriptions about the life, legacy and contributions of the Washington County lawmaker. The Thomas Kennedy Center will serve as a cultural and educational attraction for visitors from throughout Maryland and beyond. As an educational focal point for students, the center will be a public-private partnership. A nonprofit was established earlier this year to make the memorial and center a reality. The idea for the statue was conceived by Rabbi Plost and approved by the board and congregation of B’nai Abraham. The Hagerstown City Council recently provided the space for the park and center. Park and center supporters say they plan to raise the $350,000 required for the project at the city, county, state and private sector levels. An anonymous seed donor is currently willing to match up to $50,000 in donations. 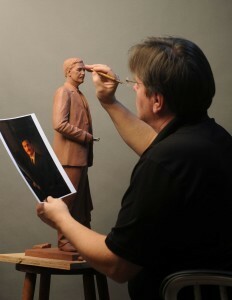 Antonio Tobias Mendez, a Washington County native and resident and internationally known artist, was selected as the sculptor for the Kennedy project. Among Mendez’s local works are statues of the late Supreme Court Justice Thurgood Marshall on the grounds of the Maryland State House in Annapolis and six Hall of Fame Orioles baseball players at Oriole Park at Camden Yards.